The Everylady's cook-book (1924), with its peculiar cover featuring a small boy about to carve a chicken, was published in Australia but aimed at New Zealanders as well – the cover notes that the publisher would post it to New Zealand. It contains over 1,000 recipes, including 33 soups, 38 recipes for joints of meat, 70 puddings and pastries and 25 sweets. 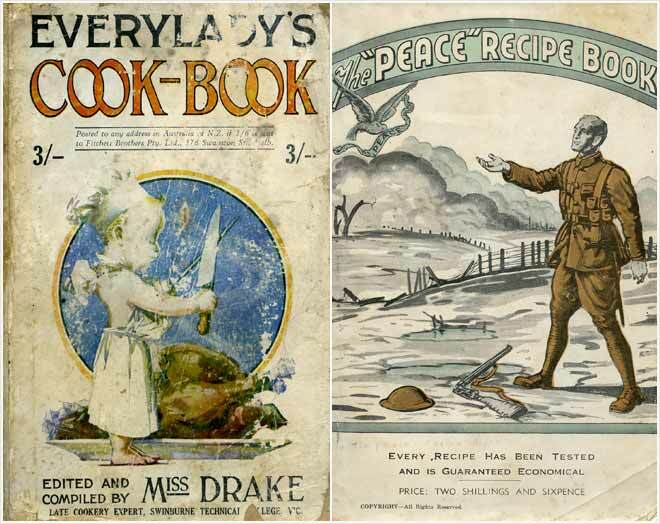 Elsie Harvey's 'Peace' recipe book (1940s) was sold door to door. The cover shows a First World War soldier, but the contents of the book and its references to Second World War rationing and the abdication of King Edward VIII in 1936 show that it was published in the 1940s. Some of the book's recipes are named after celebrities and royal figures.